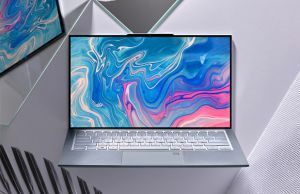 The 15-inch Asus Zenbook Pros have been some of the most popular thin-and-light premium laptops of 2017, alongside the Dell XPS 15, the Lenovo Yoga 720 and Yoga 730, and perhaps the HP Omen 15. With the launch of the Intel Coffee Lake hardware platform in early April 2018, we were expecting Asus to update the series to the new hardware, and as Notebook Italia discovered, the updated SKUs are now listed on Asus’s official website. 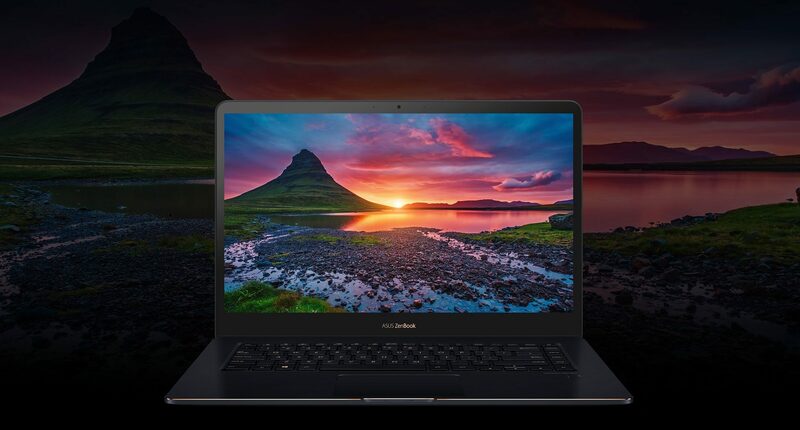 Just like with the previous generation, Asus offers two distinct series of the updated Zenbook Pro, the UX550GD with Nvidia GTX 1050 4GB graphics and the UX550GE with Nvidia GTX 1050Ti 4GB graphics. 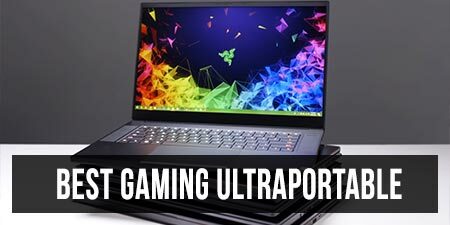 It’s a pity there’s no GTX 1060 Max-Q version, that could have made the Zenbook Pro a more worthy competitor for 2018 ultraportables like the Dell XPS 9570 and Gigabyte Aero 15. Both are of course built on Intel Coffee Lake platforms, with the new Intel 300 series chipset, support for faster DDR4 2400 MHz RAM and faster Wireless/Bluetooth solutions, among others, as detailed in this article about the 8th generation Core hardware. 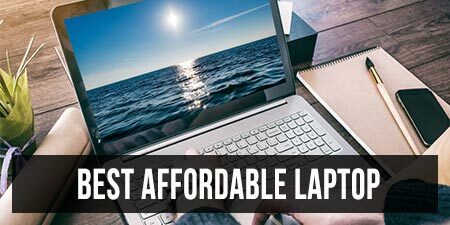 The choice in CPUs includes the entry level Core i5-8300H (quad-core, HyperThreading, 8MB Cache), the mid-range Core i7-8750H (six-core, HyperThreading, 9 MB Cache), and also the high-end Core i9-8950HK (six-core, HyperTreading, 12 MB Cache). 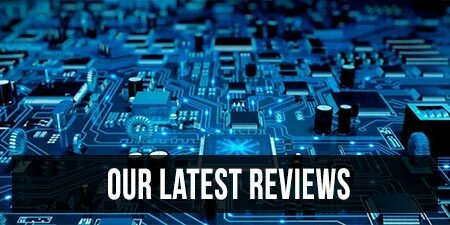 As detailed in our other articles, the i5-8300H is an excellent entry-level CPU whose performance matches that of the KabyLake i7-7700HQ in most tasks, while being cheaper and a bit more efficient. 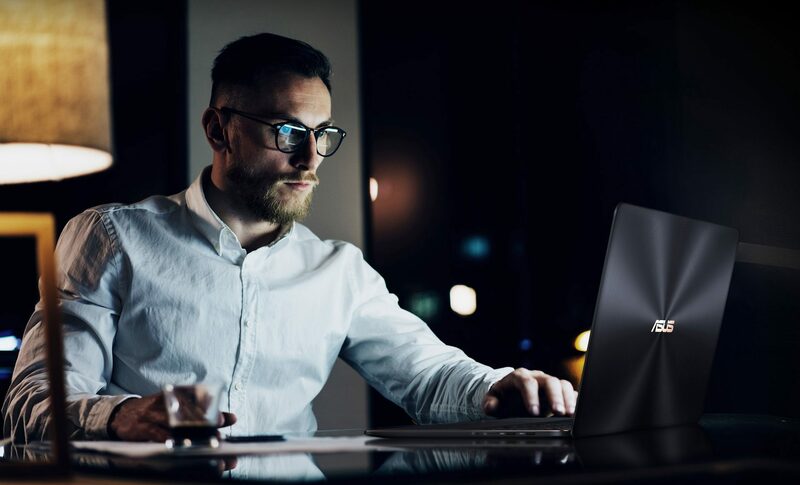 The i7-8750H offers a significant boost in performance in multi-core loads, due to the 50% increase in cores and working threads, but its behavior is greatly influenced by the cooling solution’s ability to keep temperatures at bay and prevent throttling. Last, but not least, the i9-8950HK runs at higher clocks than the i7 and can yield even better results in demanding multi-core activities. 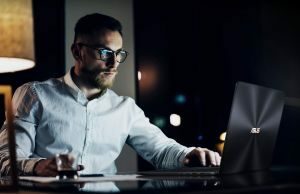 The i9 is also an unlocked processor which can be overclocked to even higher than stock speeds, but again, that matters only as long as the cooling can prevent throttling. 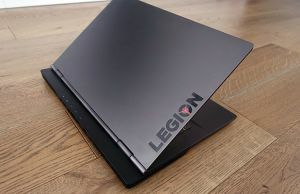 If you’ve read our reviews on the 2017 Zenbook Pros, namely the UX550VD and UX550VE, you probably know by now they had a hard time keeping performance at bay in games or other tasks that stressed both the CPU and GPU simultaneously. The GTX 1050 models could be tweaked to perform well with undervolting and repasting the components, but the GTX 1050 Ti configurations were just too much for the cooling to handle. That’s why I’m looking forward to find out if Asus did anything to improve the cooling on the new units, or just plastered the Coffee Lake hardware on the same design. 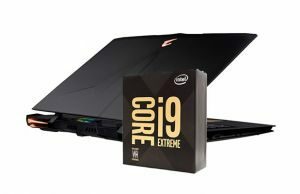 If they kept the same internal design with few heat-pipes and obstructed air intake and output cuts, then I’m pretty sure these 2018 models will throttle as well and not offer the performance you’d expect from the six-core i7 and especially the i9. From the little we know so far, the 2018 models look exactly like their predecessors and are the same size and weight. 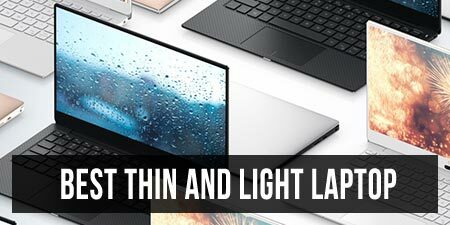 The hardware specs are also very similar, with up to 16 GB of soldered RAM and 1 TB PCie SSD, and the only internal difference is the slight change in battery capacity: 71 Wh – 2018 models vs 73 Wh – 2017 models. 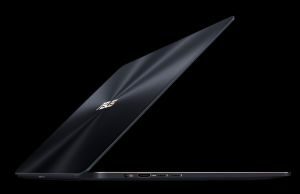 Even the demo on Asus’s website in fact suggests the same internal design, as you can see comparing the picture below with that of the UX550VE’s layout. Other changes are the inclusion of a bigger power brick (150W vs 120W) and the option for a UHD screen with 100% AdobeRGB color coverage, which professionals will probably appreciate, but without an impact on the internals. 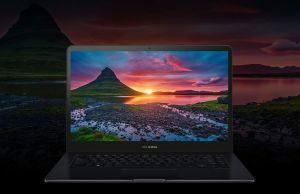 All in all, the 2018 versions of the Zenbook Pro 15 look a lot like just hardware refreshes of the older models. We’re looking forward to see how they actually perform in our future reviews, but given the issues of the previous generation with performance in demanding loads, as well as their rather average typing experience and build, I would have expected a more chiseled update. Stay tuned for more details, we should find extras at Computex in June and then expect these to be available in stores during the Summer. Yup, I don't understand how they it could possibly cool the i9 CPU.. It will trick buyers into thinking they will get more performance, when in reality it may clock up 1 or 2 cores to 4.8GHZ for a short time but then throttle and if 4+ cores fully loaded, major throttling i'm sure. 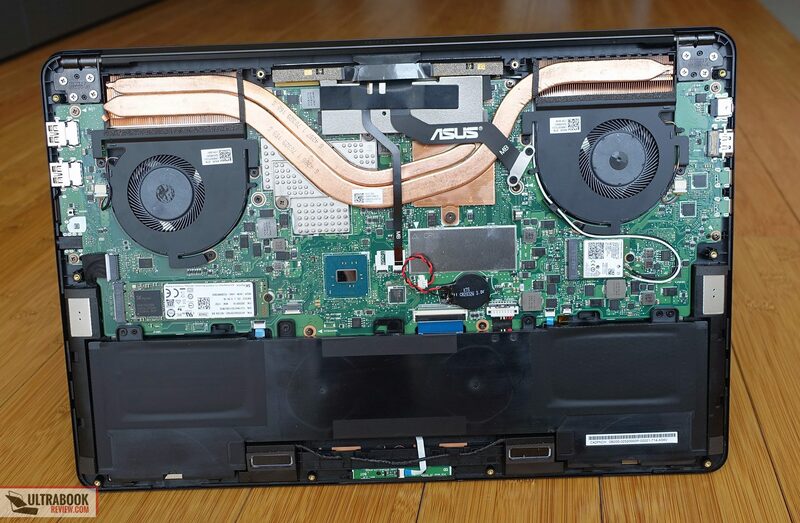 Hi, does this laptop have the extra cooling pipe underneath the motherboard, like the ux580?or it's basicaly the same cooling solution as the current ux550? as far as I can tell, yes. I wasn't aware of the extra heatpipe at the time of the initial article, though. Won't be enough!! Heavy throttling with the i9 in the 15" Macbook pro circulating the internet, same thing with this laptop. Consumers being tricked. 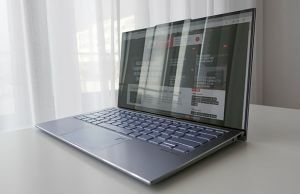 i7-8750h is hard enough to keep cool in a thin laptop chassis. 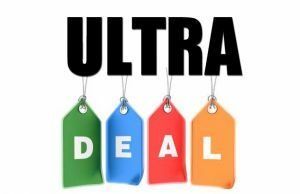 I got the UX550GD with i5-8300H, 8GB of RAM and 512GB SATA3 SSD. This device has a somewhat sturdier chassis than last year's gen but the fit and finish is not great (you can see the machining marks on the sides of the aluminium panels – screen and deck, where the ports are). The device (even with an i5) throttles when running a 10 minute stress test using intel XTU with no modifications made (the throttling indicator started blinking after a few minutes and then pretty much remained on until the test finished). Fans don't seem as aggressive as last year's gen and coil whine is present but not as loud as on last year's model. The keyboard seems better than last year's version and the backlight on it seems more uniform. The touchpad is just as good and they finally moved the finger print sensor under the keyboard, on the right. Speakers sound great, screen is bright enough (same as last year's), very slight bleed, vivid colors and good viewing angles (mine also comes extra with a stuck pixel smack in the middle of it). ASUS clearly did not address the thermal issues of this chassis and it is quite a disappointment. Hey, thanks for the feedback. It's the same cooling as with the VD/VEs and a hotter processor. Try to undervolt with Throttlestop, it's simple and safe. Also, use HWInfo to log frequencies and see what that Throttle indicator actually means and how low do they actually drop. You can simulate a 100% load with Cinebench, prime95, etc. The i5 should do fine in this chassis with some undervolting, if there's no particular pasting issue on your unit, imo.